Home Blog HomeResearchWhat is SDH and what is the difference between SDH and PDH? What is SDH and what is the difference between SDH and PDH? Summary: SDH is very useful equipment that is used for the telecommunication sector in easy transfer of data. Earlier PDH was widely used but due to some of its weaknesses, SDH has replaced the use of PDH. But not everywhere. Point to Point applications are still used mainly by PDH, and also, it’s cheaper. PDH or the plesiochronous digital hierarchy is a popular technology that is widely used in the networks of telecommunication in order to transport the huge amounts of data over the digital equipment for transportation like microwave radio or fiber optic systems. The term plesiochronous has been derived from the Greek work ‘plesio’ that means ‘near’ and ‘chronos’ meaning time. This means that the PDH works in a state when the various different parts of a network are clearly synchronized. But with the change in technology, the PDH is now being replaced by the SDH or what is popularly called as synchronous digital hierarchy. The SDH is useful equipment that is used in most of the telecommunications networks. This PDH helps in proper transmission of the data that generally runs at the similar rate but allows some slight variation in the speed than the nominal rate. The basic transfer rate of the data is 2048 kilobits per second. For instance, in each speech transmission, the normal rate breaks into different thirty channels of 64 kilobits per second along with two different 64 kilobits per second in order to perform the tasks of synchronization and signaling. The typical rate of transmitting the data over the fiber optic systems is 565 Mbit/sec in order to transport the data in the long distance. But as the technology has improved with the passing of time, now the telecommunication companies have replaced the PDH equipment with that of the SDH equipment, which has the capability of transmitting the data at much higher rates as compared to the PDH system. The SDH is an international standard that is highly popular and used for its high speed data transfer of the telecommunication and digital signals. This synchronous system has been specially designed in order to provide a simple and flexible network infrastructure. This system has brought a considerable amount of change in the telecommunication networks that were based on the optical fibers as far as performance and cost were concerned. Asynchronous structure that is rigid. Non availability of world standard on the digital formats. No optical interfaces world standard and without an optical level, networking is not possible. Apart from all the advantages mentioned above, the SDH also has various management capabilities such as performance management, security and access management, configuration management and the event or the alarm management. So, we can clearly make a distinction between the PDH and SDH systems so that as per the needs of the telecommunication, the appropriate transmission system can be used. Please note also, that PDH, if we talk as n x E1 G.703 lines to be transmitted, can be developed only up to 16 E1 lines – 34 Mbit/s. But SDH – can reach 155 Mbit/s, which corresponds to STM-1, can reach 622 Mbit/s – STM-4. Good example of PDH fiber multiplexer is this product. However, it has to be noted. 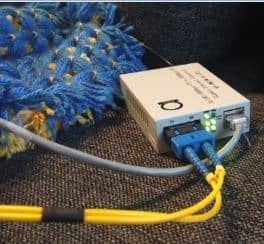 that AD-net has done a huge work bridging the gap between SDH and PDH systems, offering customers a SDH systems – particulary from miniSDH and microSDH range, and – close to PDH price! For example, most of the suppliers, if we talk about more than 16E1 – are not able to offer units at reasonable price and still 1U or even 2U high. AD-net have breakthrough unit called AN-SDH63, which is just 1U high, and can send 63E1 over the same fiber.